316 S/S Inner - 25mm Ins - 304 S/S Outer (0.5mm Fully Welded). Push fit, twin wall, insulated, stainless steel flue system for use on gas and oil fired condensing appliances. Fully welded and sold complete with locking bands and seals. Midtherm TW-LTC is designed for the commercial market serving gas and oil condensing installations only. 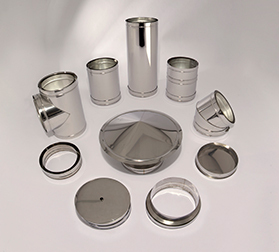 TW-LTC has a 0.5mm 316 BA grade stainless steel inner liner and 0.5mm 304 BA grade outer casing with lock formed seams and has a 25mm insulation. Sold complete with seals. It is manufactured using the latest manufacturing and welding technology ensuring high quality and value for money. Lengths and fittings have a quick and easy to use socket and spigot jointing system. Locking bands are used to secure the joint on site.